When deciding on trees for your home landscape, tree strength is an important consideration. Nature presents trees with many challenges, and having trees that can withstand the onslaught is important -- especially within falling distance of your house. Tree strength comes in several forms, from strength of wood to resilience and endurance. The strongest type of tree is the one best suited to the demands your climate and garden present. 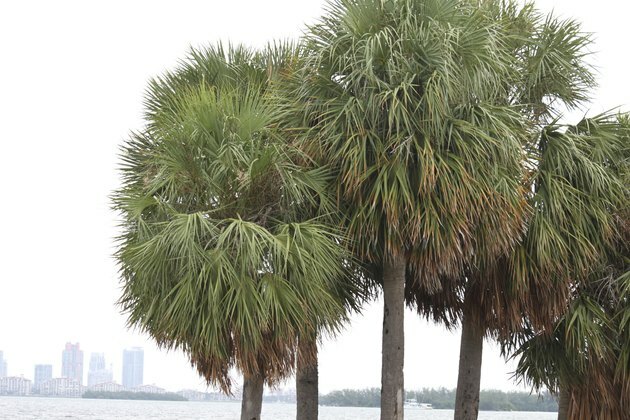 Resilient cabbage palms grow in Miami, Florida. Gardeners speak of hardwood and softwood trees. Both tree types have similar cells, but hardwoods have special fibrous cells in addition. The added fiber, slower growth and increased density add physical strength and hardness to their wood. Hardy from U.S. Department of Agriculture plant hardiness zones 8 through 10, live oaks (Quercus virginiana) are strong, damage-resistant natives with wide-reaching root systems that anchor dense hardwood trunks and limbs. When injured, they seal off damaged areas so decay can't spread. Sugar maples (Acer saccharum), hardy in USDA zones 3 through 8, deserve their nickname rock maple. Their tough wood and strong branching withstands wind, snow and heavy ice with little breakage. In regions where strong winds rule, tree strength doesn't come by standing firm against storms. The strongest survivors overcome through give and take. Hardy in USDA zones 8 through 10, the cabbage palm (Sabal palmetto) yields to the elements, leveraging resilience instead of resistance. This native's pliant leaves emerge straight from the trunk to align with hurricane winds. Cabbage palm tolerates salt, drought, frost and standing water, pairing strength with ornamental grace. Bald cypress (Taxodium distichum), hardy in USDA zones 4 through 9, provides another resilience lesson. Its soft, feathery foliage allows high winds to pass without damage. Native to swamps, this rot-resistant, deciduous conifer readily adapts to drought, even to the point of dropping its foliage. When moisture returns, it leafs out again and continues on. Many landscape trees come and go, in a few years or a human lifetime, but some trees endure centuries without human intervention. Strong enough to withstand extremes and neglect, the common olive tree (Olea europaea) thrives in desolate, drought-ridden, nutrient-poor soil and can be invasive in some locations. 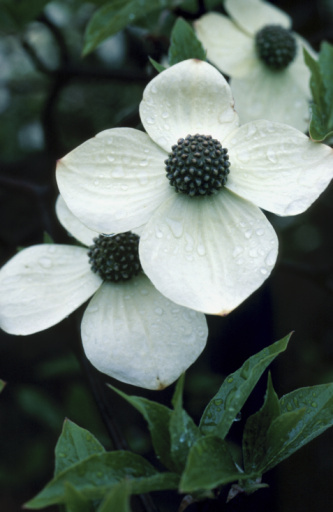 Hardy in USDA zones 8 through 10, some Mediterranean specimens date back millennia. The giant sequoia (Sequoiadendron giganteum), hardy in USDA zones 6 through 8, belies its name when grown a mere 60 feet tall in landscapes. 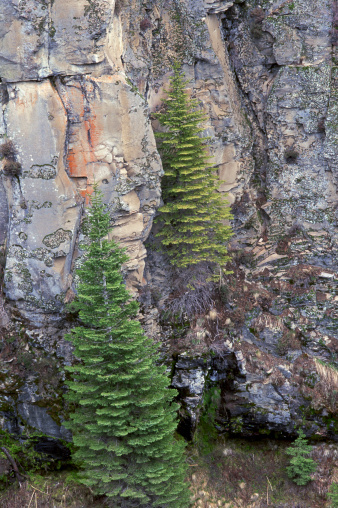 In its native habitat, awe-inspiring 300-foot giants attest to this tree's enduring strength. Age estimates date some giant sequoias at more than 2,000 years old. The strongest type of tree for any situation is a healthy tree suited to the conditions. Proper care increases physical strength, tolerance and longevity. Learning to bend is important. Leaving young trees unstaked to sway in the wind increases trunk diameter, strength and resilience. Pruning also plays a big role. As oaks suggest, strong branches form 45- to 90-degree angles with the trunk. Weaker angles lead to more breakage and shorter life. Proper pruning encourages good branching, health and strength. Removing dead, damaged and crossing branches promotes strong branch angles. Use a sharp pruning saw, and sterilize the blade with household disinfectant before and after you prune to prevent spreading disease. Healthy, well-managed trees -- whether stalwart or pliant -- stand strong in home landscapes.